With the motherboard markets so competitive right now, manufacturers must take extra measures to ensure their products stand out, and that you the consumer buy them. This competitiveness usually translates into more features for the consumer, and flashier appearances in some cases. 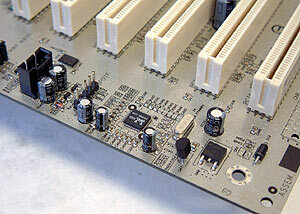 One of the most popular tools of the trade for main board and video card makers has been the use of multi-coloured PCB's. A few years ago, the colour of a motherboard was determined by how it was made, usually ending up green or brown in colour. A few manufacturers broke the mold and tried black PCB's, which were originally marketed as Mil Spec grade if I remember correctly. One thing lead to another and now we have motherboards on store shelves in every colour, from purple to blue, green to red. Albatron have chosen a nice shade of blue for most of their motherboards, but the PX845E is obviously different... it's coated in silver. 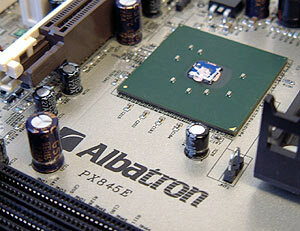 According to Albatron, the coating on this motherboard is actual silver. Not silver colour, but the actual metal suspended in a binding agent. 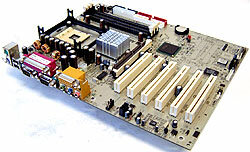 The apparent benefits of this are thermal dissipation for board mounted components, and increased EMI shielding. 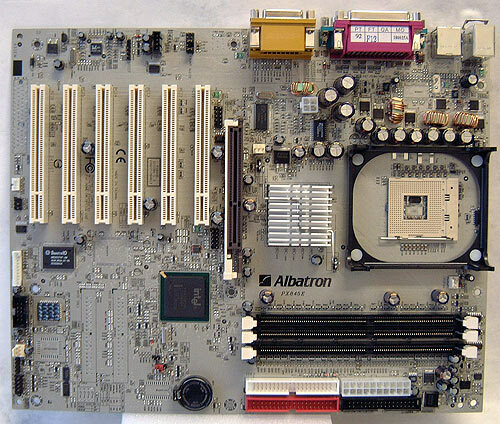 Albatron claim that in their own testing, on average a board with this silver coating produces 47% less EMI emissions than a non-coated motherboard. Based on the i845E chipset, the Albatron PX845E supports both 400MHz and 533MHz Pentium 4 processors with up to 2GB of PC1600/2100/2700* DDR RAM (*unofficially supports PC2700). The PX845E shown here itself is basically a no frills solution - which just 5.1 audio (AC'97 codec) audio and a Smart Card and Memory Stick reader to mention. The "Pro II" variant comes with all the extra stuff, in case you need it. In any case, on the PX845E there are three available DIMM slots, and when you need to expand the board with more devices you have a full six PCI slots to choose from. AGP support is 4X because this is an i845E chipset based board, and not a i845PE iteration. Wow, that silver PCB does look pretty sweet! The layout of the motherboard is very good, with both the main ATX power connector and the IDE and floppy drive connectors in just the right spot next to the DIMM slots. 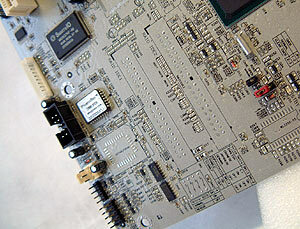 Because the motherboard does not have on board IDE RAID there is nothing that will get in the way of the PCI slots. Albatron are now using a sliding AGP lock with their motherboards, and it seems to be a change for the better; providing a much stronger grasp on those pesky AGP cards. Looking at this board you really do notice that everything is well labelled, and easy to reach. After testing all the motherboards we have here, it is really nice not to have to crack open the manual each and ever time you need to wire the front panel power switch/reset/LED's. Let's jump right into the fun stuff and see how well the Albatron PX845E overclocks!